In case you have not read Susan Pedersen’s review of Robert Vitalis’ White World Order, Black Power Politics: The Birth of American International Relations, you should. The Journal of Race Development, established in 1910, was one of a spate of academic journals, associations and institutes founded as American social scientists came to grips with their country’s expanding global and imperial role. The journal’s title, jarring today, reflects perfectly the centrality of the category of ‘race’ to political science at the time. During the ‘Wilsonian moment’ of 1919, the journal was rechristened the Journal of International Relations without much disturbing its contributors or character. A few years after that, it was bought and renamed again by a New York-based association of internationalist businessmen, officials and academics, the Council on Foreign Relations. Yes, that’s right: it becameForeign Affairs, the pre-eminent journal of the foreign policy establishment. This is just one of the startling and illuminating genealogies Vitalis pieced together during the ten years or more he spent researching this book. White World Order, Black Power Politics does two things. First, it provides a critical history of the institutional development of the field of international relations in the United States, from its founding at the turn of the century through to the Cold War. This history is radically unfamiliar: the ‘origin story’ taught on undergraduate courses, which traces the field’s core concepts (realism, liberal internationalism) back to Thucydides or Machiavelli or Wilson is, Vitalis insists, a post-1945 invention. Instead, at the moment of its American birth, ‘international relations meant race relations.’ Races, not states or nations, were considered humanity’s foundational political units; ‘race war’ – not class conflict or interstate conflict – was the spectre preying on scholars’ minds. The field of international relations was born to avert that disaster. A blunter way to put this, and Vitalis is blunter, is that international relations was supposed to figure out how to preserve white supremacy in a multiracial and increasingly interdependent world. Segregation and Jim Crow had done the trick at home, where non-white populations were in the minority, but how could white America govern its newly annexed and overwhelmingly non-white territories without losing its republican soul? A few white scholars thought the task impossible. Indeed, one of the most famous – John Burgess, founder of Columbia’s School of Political Science and of the Political Science Quarterly – opposed President McKinley’s imperial adventuring precisely because it threatened the democratic institutions he thought suited to ‘Teutonic’ peoples alone. ‘American Indians, Asiatics and Africans cannot properly form any active, directive part of the political population which shall be able to produce modern political institutions,’ he warned. Unless it wanted to go the way of Rome, America should leave empire alone. Something to think about for students of development and liberal international institutions, both big and small. The book is available for purchase here. I can’t wait for my copy to arrive. The ICC prosecutor has dropped the charges against President Uhuru Kenyatta, citing the lack of evidence due to non-cooperation by the Kenyan government. Mr. Kenyatta stood accused of playing a significant role in the 2007-08 post-election violence in Kenya in which at least 1300 people died and over 300,000 were displaced. The Kenyan case was always going to be a tough one for the ICC. Kenya is neither the DRC nor Sudan. As soon as Kenyatta got elected Brussels, London, and Washington made it clear that they would not sacrifice their economic and geopolitical interests in the wider eastern Africa region on the alter of justice. This gave Mr. Kenyatta latitude to attack the legitimacy and legality of the ICC case against him both through the African Union (AU) and Kenyan diplomatic channels. Back in Kenya witnesses disappeared or withdrew their testimonies. The Office of the Prosecutor repeatedly said that the Kenyan state refused to hand over evidence relevant to the Kenyatta case. All this while Western embassies remained quiet about the case (for fear of “losing” Kenya to China). This leads me to conclude that in a perverse way, the collapse of the Kenyatta case might actually be good for the ICC. The court (and OTP) can save face by arguing that they had the authority to prosecute the case but lacked cooperation from the Kenyan state. Now, the biggest challenge for everyone involved is how to ensure that this does not get interpreted as blanket immunity for all sitting presidents who are suspected of committing atrocities against their citizens. The deterrent effect of the ICC should be preserved. The collapse of the case has interesting implications for Kenya’s domestic politics. It is common knowledge that the political union between President Kenyatta and Deputy President Ruto ahead of the 2013 election was primarily driven by their ICC cases. Mr. Kenyatta’s case has collapsed. Mr. Ruto’s is ongoing. This will diminish Mr. Ruto’s bargaining power in the alliance. It will also demand for Kenyatta’s allies to walk a tight rope and ensure that they do not signal to Ruto’s supporters that they no longer need them now that Kenyatta is off the hook. Ruto’s bloc, URP, has the second largest number of MPs in the National Assembly. This will give him leverage of some sort, even as his case goes on. Simply stated, without the ICC bond, the union between Kenyatta and Ruto will become more transactional. This means that mistakes will be made, and each side will have to try hard to ensure that disagreements over specific issues do not get blown out of proportion. Knowing Kenyan MPs, this will be a tall order. Lastly, now that the ICC is behind him President Kenyatta might actually seriously tackle the issue of insecurity in Kenya. It is widely known that since he took office his approach to security matters has been informed by the desire to rid his administration of anyone who might have been sympathetic to the ICC. The former chief of intelligence (who may have played a role in “fixing” both Kenyatta and Ruto) and other senior officials who may have testified against him were let go. It took the slaughter of more than 450 Kenyans at the hands of terrorists and armed bandits over the last 18 months for the president to fire the chief of Police and the Cabinet Secretary in charge of internal security. One can only hope that now Kenyans will get a more responsive security sector. What does this mean for reconciliation in Kenya? Not much. 2007-08 shattered the myth of Kenya as a peaceful oasis in an otherwise volatile region. Kenyans are yet to comprehensively deal with the shock of seeing what neighbors could do to one another. The preferred MO has been to sweep things under the rug. That was the logic of the Kenyatta-Ruto alliance (the land issues that erupted in clashes between their respective constituencies have not been resolved). It is the same logic that drove the peace-at-all-costs campaign that stifled open discussion of contentious national issues ahead of the 2013 election. For better or worse, Kenyans are desperate to move on past 2007-08. But the weight of historical injustices, inequalities, and the continued failure to address them are constant reminders that 2007-08 might happen again. So far the ICC question has been the singular preoccupation of the Kenyatta administration. It appears that the Kenyan government is willing to pull out all the stops to halt the cases against the president and his deputy. Sadly, instead of a sober approach to the process of doing so, Nairobi has chosen to antagonize both the Hague Court and the West. As I have argued before, Kenya has leverage vis-a-vis the West (security in the Horn and Somalia in particular; its status as host to regional diplomatic and aid efforts; and role as the biggest economy and potential gateway to the region) that it can use in a smart way to get concessions from Washington, London and Paris on key issues. Rather than wish for a restructured P5 (see post below), Nairobi should think of how to get its way with the current one. Instead of the misguided chest-thumping about hollow sovereignty in a Chinese built conference hall in Addis under the banner of an organization partly funded by the EU, Nairobi could have chosen a different path. The reality is that gone are the days when we were the “island of peace” in an unpredictable and violent part of the world. Over time, the world around us has changed, but we are yet to wake up and smell the coffee. Ethiopia is no longer in civil war and is quickly becoming a better investment opportunity for manufacturers both due to the low price of its electricity and the size of its population, about 90 million people. It is one of the fastest-growing economies in the world. Tanzania is no longer socialist and is now the darling of America. Apart from its own vast mineral, oil and gas deposits, Tanzania is the new gateway to the DRC and is receiving mammoth investment from both China and America. China is building what is being called a “mega port” for Tanzania at Bagamoyo, which is more than 30 times the size of Mombasa, as part of a $10 billion investment package for Tanzania. When completed, it is bound to take away all central Africa business from Mombasa port, which will be left to serve only Kenya and Uganda. ……. Let us stop comparing ourselves with other countries. The painful truth is that Kenya is not Syria. In the Middle East, Syria is the only foothold for China and Russia. The rest of the countries are either fundamentalist or pro-Western. In Africa, China and Russia are spoilt for even better choices. They will only go so far to help us out [Indeed some have started asking of the Afro-Chinese engagement has peaked]. The complete madness lack of tact that Mr. Mwangi points out will no doubt be on display this afternoon as the National Assembly debates Kenya-UK relations (Recently Kenyan MPs allied to the president have chosen to prove their loyalty by taking extreme positions on the ICC issue). This comes in the wake of the UK’s support of an amendment of the ICC statutes to allow President Kenyatta and his deputy to attend their trials via video-link; and stated opposition to granting sitting presidents full immunity from any prosecution under international law while in office as has been demanded by Kenya. The hurdle remains high for the Kenyan (AU) amendment proposals to the Assembly of Member States, especially after it emerged that 9 African states may not be illegible to vote on account of not having paid their dues. According to a recent poll, 67% of Kenyans are of the opinion that President Kenyatta should attend trial at the Hague in person to clear his name. The UN Security Council has rejected Kenya’s (and the African Union’s) request for a one year deferral of the case against President Uhuru Kenyatta and his deputy at the Hague. The two stand accused of crimes against humanity committed following the disputed elections in 2007. More than 1300 people died, and hundreds of thousands were displaced. The US, UK, France, Australia, Guatemala, Luxembourg, South Korea and Argentina abstained to stop the deferral request. China, Russia, Togo, Morocco, Pakistan, Azerbaijan and Rwanda voted for a deferral. African leaders have in the last two years been on an ill-advised crusade against the ICC, terming it as a “race hunting” tool of “declining” Western powers. Kenyatta and Ruto are innocent until proven otherwise, but their attempts to make their personal cases at the ICC a regional struggle of Africans against imagined neo-colonialists bent on usurping African sovereignty is a little misguided. The Kenyan case is different (Kenya is not Sudan or the DRC) and ought to have attracted special consideration from the court (see closing remarks below). However, despite its faults the ICC is all the continent has in the quest to hold its leaders accountable. I reiterate, murderous dictators in Africa and elsewhere should never be allowed to have internal affairs. Here is the government’s total freak out response following the UNSC vote, with some comments from yours truly. Kenya takes note of the outcome of the United Nations Security Council meeting on peace and security in Africa, and specifically on the subject of the request for deferral of the Kenya ICC cases. Kenya wishes to thank China and Azerbaijan who, during their stewardship of the Security Council, have been professional and sensitive to the African Union agenda. Wow, this is how bad things have become. That Kenya finds friends in states like Azerbaijan. Yes, this is the place in which the president recently announced the election results even before the polls opened. These are our new committed friends. We are going places. Kenya wishes to thank the seven members of the Security Council who voted for a deferral and is particularly grateful to Rwanda, Togo and Morocco – the three African members on the Security Council – for their exemplary leadership. Again, the only country we should be associated with on this list is perhaps Rwanda. I wish we could do what they have done with their streets, and corruption, and ease of doing business. But by all means we should not borrow their human rights record. Oh, and please let’s stay away from their variety of democracy. This result was not unexpected considering that consistently some of the members of the Security Council, who hold veto powers, had shown contempt for the African position. The same members and five others chose to abstain, showing clear cowardice in the face of a critical African matter, and a lack of appreciation of peace and security issues they purport to advocate. Letting the trial go on does not threaten peace and stability in Kenya. This is an empty argument. There will not be any spontaneous violence. Furthermore, the president is not the operational commander of the KDF. He is the Commander in Chief. He gets to issue orders from some room somewhere. Orders can be issued from anywhere. And remind me again how this trial impacts security ALL OVER AFRICA, other than by raising the cost of genocidal activities by African presidents? Oh, and did I mention that the African Union Mission in Somalia (AMISOM) is almost entirely paid for by the European Union? Inevitably, it must be appreciated that the outcome of this vote demonstrates that the Security Council does not serve the interests of a majority of its members and is clearly in need of urgent reform. It cannot be that a few countries take decisions that go against reason and wisdom in a matter so important to nearly one billion Africans. One billion Africans. Really? I had no idea our president was this important of a man. One billion Africans. Many of whom starve to death; or die of treatable illnesses; or never make it to their first or fifth birthday because their leaders steal all the money meant for medicine. These Africans? Why should their names be invoked to protect the same leaders that have confined them to degrading penury for the last half century? Why, I ask? Also, the claim that Africa is united against the ICC is false. We all know about the divisions that stalled the silly idea of a mass walkout from the ICC by African states. The African Union, in one voice, took the unprecedented step of making a simple request to the Security Council, bearing in mind the security and stability it seeks to achieve on the continent. But the Security Council has failed to do this and humiliated the continent and its leadership. Ahh. Now the truth comes out. It is not about the one billion Africans after all. This is about the humiliation of the African leadership. It is about protecting the sovereignty of a few inept rulers. Forget the one billion Africans. It is about their big men rulers who steal tax money and stash it away in bank accounts in the same Western countries they like to call names. The Security Council has failed the African continent, which will have to make its own judgment in the coming days and weeks about how it wishes to engage with the Security Council, which obviously does not believe the voices of more than one quarter of its members is significant enough to warrant its serious and purposive attention. The security council has failed African leaders. Not the African people en masse. Africans want to have elections without having to worry that voting one way or the other will result in their houses being torched or their mothers, sisters and brothers murdered or raped. They also want freedom from ignorance, disease and material want. Is that too much to ask? The African Union’s request to the Security Council included its key resolutions at the Special Summit on the ICC. The important one for the Security Council to note was the one that categorically says that no sitting Heads of State or Government may appear before the ICC. Kenya regrets failure of important members of the UN Security Council to have due consideration of Kenya’s critical role in stabilizing the Horn of Africa and the Great Lakes regions, and their reckless abdication of global leadership. Wait, are these important global leaders in the UNSC the same ones President Kenyatta termed as “declining powers”? What makes them important now? Just for the record, I am part of the 67% of Kenyans who in a recent poll were in favor of the president attending court at the Hague. Having both the president and his deputy on trial will serve a great symbolic task of demystifying the Kenyan political leadership. The demonstration effect to all politicians, voters and criminal gangs alike will be clear: You cannot kill innocent civilians and get away with it. In my view, the best case scenario is having both men attend trial and then get a not guilty verdict. Kenyans are nowhere near ready to discuss frankly what happened in 2007-08 or the deeper issues of ethnicity and economic disparities that often mirror ethnic lines and how to deal with these issues at the national level. A forced conversation, especially one that has a foreign touch in the form of a court verdict, may result in unpleasant consequences. This would be a less than ideal outcome, but one that would not necessarily be catastrophic for the country. The constitution is clear on succession should either one or both leaders be found guilty and jailed. Since this post went up Musalia Mudavadi joined the UhuRuto coalition. This sets the stage for a real two horse race for the presidency between Raila Odinga and either Mudavadi or Uhuru Kenyatta. It is very likely that Mudavadi will run as a compromise candidate due to the charges Uhuru is facing at the ICC. This development, considering Kenya’s ethnic arithmetic, essentially gives the Uhuru camp a head start ahead of the March 2013 presidential elections. Whatever happens, this promises to be a very interesting and close presidential election. The presidential race in Kenya’s 2013 elections is beginning to take shape. Yesterday Uhuru Kenyatta and William Ruto unveiled a political pact that will see them run on a joint ticket, with Mr. Kenyatta at the top of the ticket. Messrs Uhuru and Kenyatta both have pending cases at the ICC on charges that they were behind the post-election violence that rocked Kenya in 2007; leaving 1300 death and more than 300,000 displaced. This has led some to dub their joint platform the “ICC ticket,” since many see the union of the two as solely driven by their joint desire to earn immunity from prosecution by the ICC once they secure the presidency. The second big coalition will see former allies turned foes and then allies – Raila Odinga and Kalonzo Musyoka – come together. Mr. Musyoka is the sitting Vice President while Mr. Odinga is the Prime Minister. The latter is believed by many to have been the winner of the disputed 2007 presidential election. The electoral commission at the time said it did not know who won the election and declared President Kibaki reelected, sparking two months of violence across the country. The third potential political grouping might gravitate around Odinga’s former deputy, Mr. Musalia Mudavadi. Mr. Mudavadi has been rumored to be in talks with several smaller parties, including those of Peter Kenneth, Raphael Tuju, among others. The latest developments will make for an interesting race moving forward. The ethnic arithmetic involved – Kenyans vote largely along ethnic lines – will make for a very close race (More on this soon). Messrs Odinga and Kenyatta are the clear front-runners, with the former having a slight lead in the most recent opinion polls. The constitution requires the president elect to win 50 percent plus one votes, making it very likely that there will be a runoff between the top two contenders after the first round. The ethnic calculations makes Odinga, a Luo, the likely winner in case of a runoff (Uhuru, a Kikuyu, is the son of Kenya’s first president. The current president, Mwai Kibaki, is also a Kikuyu.) But Mr. Kenyatta might still win in the first round. The biggest uncertainty moving forward will be the candidature of both Uhuru and Ruto. Following the opening of their cases at the ICC they had to resign as cabinet ministers. Already there is a petition in court seeking to bar them from running in the upcoming elections on grounds that their integrity is questionable. The constitution requires only individuals of the highest integrity to be eligible to run for office (It is hard to see how any Kenyan politician will avoid having at least one strike against their candidature). The supreme court may eventually bar Uhuru and Kenyatta from running – the talk in the street is that if they are unfit to be mere cabinet ministers then they should also not occupy the two highest offices in the country. Their supporters obviously disagree. In their rallies “UhuRuto” have played the nationalist card, insisting that not foreigners (read the ICC) but Kenyans will decide who will be their next president. It is still unclear what course of action they and their supporters would take were they to be barred from running. That the ICC’s website crashed an hour before the ruling was given underscores the importance of today’s ICC ruling. In the end it emerged that charges against Deputy Prime Minister Uhuru Kenyatta, Head of Civil Service Francis Muthaura, MP William Ruto and radio Presenter Joshua Sang were confirmed. Former police commissioner Husein Ali and MP Henry Kosgey will walk, at least for now. The political implications of the decision will be huge. Firstly, President Kibaki must decide whether or not to retain two of his most trusted lieutenants in the government (Messrs Kenyatta and Muthaura) even as they face charges with regard to the death of 1300 Kenyans and the displacement of hundreds of thousands. Should the president decide to stand with them I suspect that soon the courts will have to decide whether these two are fit to hold public office. Remember that Kenya has a resurgent judiciary eager to stamp its authority as an independent institution. There will be intense political pressure from Civil Society groups to see the two step aside. Equally interesting will be whether the Independent Electoral and Boundaries Commission will allow Ruto and Kenyatta to run for president in light of these developments. Again, the case might go all the way to the Supreme Court. The Kenyan constitution has a clause banning those accused of certain crimes from holding public office. The vagueness of the wording in the constitution will give the courts discretion in reaching a verdict. I suspect some activism here was well. Secondly, Ruto and Kenyatta will find it hard to sell their candidacy to Kenyans ahead of the general elections later this year. As the process continues, it will be hard for both (whether guilty or not) to hide from the gruesome crimes that were committed in 2007-08. I therefore doubt the viability of either one running for president at the top of a ticket. If they want to be on a winning team in this year’s election they must be part of a coalition. But coalition building will be hard. For one, cracks are already appearing in either camp. Ruto recently got kicked out of a party he tried to commandeer after defecting from ODM. Mr. Kenyatta is also facing a simmering insurgency within his Central Kenya camp. The other thing is that the Kenyan economic and political upper class has revealed a willingness to throw the two under the bus if they become too much of a baggage. It is telling that a group of Central Kenyan tycoons have started warming up to Prime Minister Raila Odinga, the man to beat in this year’s general election. A panel of judges at the ICC will issue their ruling tomorrow afternoon on whether or not six accused Kenyans will stand trial. The six include two declared presidential candidates. Either way the ruling will have a non-trivial impact on the pursuit of justice for the victims of the 2007-08 post-election violence (PEV). It will also significantly shape the politics of coalition building in this year’s general elections. Because of the ICC process, the Kenyan justice system has put on ice its own process of holding the perpetrators of the PEV to account. A non-confirmation of the charges against at least some of the six co-accused will add the 2007-08 PEV to the long list of crimes against Kenyans, many of which have been committed by the high and mighty, that have gone unpunished. Justice is political. Therefore, there is no doubt that if the process of prosecuting the crimes committed in the PEV returns to Kenya none of the big fish will be held accountable. That is the sad truth. This is why despite the noisy political environment, a majority of the PEV victims (and other Kenyans) still back the ICC process. At the very minimum they want justice to appear to be served. At the moment the problem of justice remains a worry largely monopolized by the 300,000 or so Kenyans in IDP camps and the relatives of the over 1,300 who were killed. [The media and the political class are squarely to blame for this shameful situation.] For the rest of the country, focus has shifted to the politics of the general elections due later this year. To this we now turn. Two of the accused, William Ruto and Uhuru Kenyatta have declared their interest in the presidency. Mr. Kenyatta is currently the second most preferred presidential candidate after Prime Minister Raila Odinga. Mr. Ruto, while not as popular nationally, still commands a sizeable chunk of the votes in the country’s most populous province – the Rift Valley. The Rift Valley has also been the hotbed of political violence in country’s history, most of it over land. A confirmation of the charges will seriously dent the presidential ambitions of Messrs Ruto and Kenyatta. It will make it harder for either of them to sell their candidacy outside of their immediate ethnic constituency. It will also give their opponents (and there are plenty) an opportunity to hold themselves as the clean candidates that ought to succeed Kibaki. Needless to say, a non-confirmation would bolster the duo’s campaigns. What will this mean for the general election? It is common knowledge that the man to beat in the 2012 election will be Mr. Odinga. The two scenarios above will impact the outcome of the election mainly through their influence on the coalition building abilities of the anti-Odinga crowd. More on this tomorrow in reaction to the ICC ruling. A few days ago a Kenyan judge ordered the government to arrest Sudanese President Omar al-Bashir if he ever sets foot in Kenya. Mr. Bashir has an outstanding arrest warrant against him from the ICC for crimes against humanity committed since 2003 in Darfur. The ruling has since metastasized into a full blown diplomatic row; Khartoum expelled the Kenyan ambassador before rescinding the expulsion, and is now threatening to cut all trade ties with Kenya, expel Kenyans living in Sudan and deny any planes leaving or going to Kenya from flying in its airspace – if the government does not take back the ruling in two weeks. The diplomatic row aside, the case has implications for the reform process in Kenya. The case is a test of the depth of the Kenyan judiciary’s new found independence from the executive. 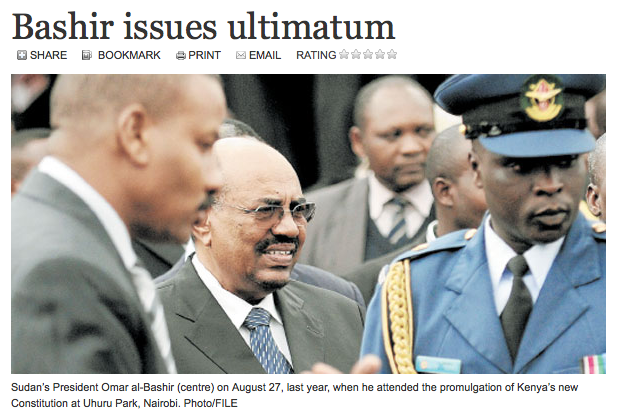 It remains unclear what the executive will do given Khartoum’s two week ultimatum. Disregarding the court ruling will come with consequences for the individuals involved – in particular the Foreign Minister and the Commissioner of Police. Current Deputy Prosecutor of the ICC, Fatou Bensouda, will become the next top Prosecutor at the International Criminal Court. What does this mean for the future of the ICC, especially with regard to African cases? ….. Bensouda becomes the first African Prosecutor at the ICC. This fact will almost surely garner the most media attention. The African Union has been adamant that an African candidate would be selected, and they got their wish. It will now be very interesting to see how the AU deals with an African Prosecutor. The AU has often expressed frustration and, at times, outright hostility towards the Court for what it, and many of its member states, see as undue bias towards African nations and leaders. Now that the AU has its chosen candidate, will its attitude and rhetoric change? I doubt it. The African Union’s opposition to the ICC was never predicated on the region of origin of the prosecutor but on the fact that, being largely a club of dictators and pseudo-democrats, it wanted to protect its own. That will not change with the retirement of Ocampo. In my view the ICC remains to be a powerful source of leverage for African civil society groups against their rulers who oftentimes are inclined to use violence in an attempt to hold on to power. Without the ICC, all these groups would have are a bunch of great powers and former colonizers full of bark and no bite and who will turn a blind eye to murderous dictatorship in the name of cheap oil and other commodities. I hope that the court will continue in its task of being a voice to the voiceless, albeit with a little bit more tact (by which I mean the acknowledgement that justice is, ultimately, political). I have previously commented on the court here, here and here. The ICC Pre-Trial Chamber Judge Ekaterina Trendafilova on Wednesday decided that the trial of suspects of the 2007-08 election violence in Kenya will not be held in the country. I am of the view that holding the hearings in Kenya would have created an unnecessary distraction from the important task of implementing Kenya’s new constitution. Already, the bigwigs accused of masterminding the violence that killed 1300 and displaced over 300,000 Kenyans have ethnicized their predicament. Holding the hearings in Kenya would have handed them an opportunity for a circus of ethnicity-charged rallies and demonstrations in Nairobi. The ICC continues to be a source of debate in Kenya and across Africa. Many have faulted the court’s apparent bias against African leaders. Some have even called it a form of neocolonialism. While admitting that the court could use a little bit more tact [principally by acknowledging that it cannot be apolitical BECAUSE it is an international court SANS a world government] I still think that it is the best hope of ending impunity on the African continent – at least until African leaders internalize the fact that it is not cool to kill your own people. Among the cases that should have been handled with a sensitivity to political realities include Sudan and Libya [and may be the LRA in Uganda]. Kenya’s Ocampo Six, the DRC’s Jean-Pierre Bemba and Cote d’Ivoire’s Laurent Gbagbo, on the other hand, should not raise questions of national sovereignty. Murderous dictators and their henchmen do not have internal affairs. In any case sovereignty for many an African country means nothing more than sovereignty for the president and his cronies. The government of Kenya has lost in its bid to convince the ICC that it has the political will and capacity to try key perpetrators of the 2007-08 post-election violence (PEV). Kenya had asked for six months to get its justice system in order and convince the ICC that it could bring to book those who planned and carried out the murder of over 1300 people and the displacement of hundreds of thousands in 2007-08. More on this here. The Kenyan political elite find themselves in a pickle. Less than two years ago parliament thought that they could punt on addressing the PEV by deferring the cases to the ICC. It turns out Ocampo and the court were actually serious. Realizing this, they (the Kenyan gov.) attempted to hurriedly create a local process with the hope of persuading the court to stop the proceedings at the Hague. But even a blind sheep could see through the government’s insincere attempts to clean up the judiciary or “investigate” the key suspects. The Kenyan civil society remains adamant that the government has neither the capacity nor political will to prosecute the crimes committed in relation to the 2007 general elections. Now the clock is ticking. With parliament and the Kenyan legal epistemic community largely in charge of naming the new judges that will staff the supreme court (and the wider judiciary) the accused and their political godfathers are in a panic. They must try and clean up shop under the current system or they will lose big, soon. Realizing the gravity of the situation, the same ethnic chiefs demigods politicians who were running around screaming “sovereignty” and “neo-colonialism” have since gone silent. The Kenyan case has also generated a lot of heat with regard to the geopolitics of the ICC. Many in Kenya and across Africa have (sometimes rightfully) criticized the ICC. But in my view it remains to be a necessary institution in the fight against impunity and murderous dictatorship on the Continent. (Pardon the phrase) We cannot throw out the baby with the bath water. Let’s not kid ourselves. Without the ICC the families of those women and children that were burnt alive in a Church in Kiamba, Eldoret or those killed in retaliatory attacks in Naivasha will never get justice. That is the reality. Remember, more Kenyans were killed in the months before the elections of 1992 and 1997 than in 2007-08 and yet the Kenyan political class merely pushed the unbearable truth under the rug. Also of note is the fact that the present anti-ICC crusade comprises those suspected to have financed opposite sides of the PEV. The situation is a grim reminder of the Swahili proverb that says when the elephants fight it is the grass that suffers. To those who talk of the ICC’s infringement on African nations’ sovereignty I’d like to pose a question: Who’s sovereignty is being violated? Is it al-Bashir’s or the Darfuris? ; is it the Central Africans’ or Jean Pierre Bemba’s? ; is it the Kenyans’ across the Rift Valley or the sovereignty of the Ocampo six? what if ruto and uhuru were jailed by the icc? Kenyan politics is currently in flux. Two key presidential candidates, Uhuru Kenyatta and William Ruto may be barred from running for public office next year on constitutional grounds. The key beneficiaries of such an eventuality will most probably be Raila Odinga and Kalonzo Musyoka, the Premier and Vice President respectively. But what would such an eventuality mean for Kenya? Over the last few weeks Uhuru and Ruto have been crisscrossing the country and holding chest-thumping rallies to prove to someone – either the ICC or the Kenyan political and economic elite – that they have the support of the grassroots. They have also issued thinly veiled threats that violence may erupt in the country if they are whisked to the Hague and barred from running for president in next year’s general election. Why does Uhuru and Ruto feel the need to do this? In my view, and according to the rules of power politics, a tiger need not shout about its tigritude [I believe it is the great son of Nigeria, Wole Soyinka who coined this phrase]. That Ruto and Uhuru have felt compelled to shout about their support-base and issue threats tells me that they are feeling the heat. The fact of the matter is that the key backers of the duo are the ones who would lose the most in case of a resurgence of violence – think of Kenyan retail, banking, insurance, media and transport barons. These are the people that will lose the most when the Mombasa-Kampala Highway is impassable and Equity Bank closes everywhere. They know this and Uhuru and Ruto also know this. Furthermore, igniting further violence would most certainly attract sterner reaction from international watchdogs like the ICC and the UN Security Council. There is also the [small] matter that now ordinary Kenyans will also know where exactly the violence is coming from. Violence is therefore not an option. Not for Ruto and Uhuru. Not for their backers. And most certainly not for the rest of Kenya. I suggest that the rest of Kenya call their (Uhuru and Ruto’s) bluff about violence next year. Their battles with justice should not derail the much needed institutional reforms that will take the country out of the miasma of mediocrity that continues to engulf most of the Continent. In the final analysis, the words of former VP George Saitoti will ring true: There comes a time when Kenya gets bigger than any single individual. Ruto, Uhuru and the wider political class are about to be schooled on this maxim the harsh way. The denouement of the saga is still uncertain. Two Kenyan political supremos, Uhuru Kenyatta and William Ruto, are appearing at the ICC in the Hague to answer to charges of crimes against humanity. The two are among six Kenyans accused by Moreno Ocampo for being the brains behind the violence in 2007-08 in Kenya that killed over 1300 and displaced close to half a million people. The ICC trial of the six is likely to bring to light the hypocrisy of Kenya’s ruling class. For far too long the political elite have used violence as a political tool. Former president Moi perfected the craft and got away with it in 1992 and 1997 (more people died then than in 2007-08). If all goes well, it appears that this time around things will be different. My hope is that the six accused will bring all to light so that Kenyans can know their leaders for who they really are. There is no doubt that ethnicity will continue to cloud Kenyan politics. But it is also true that Kenyans will, from now on, know what is at stake when their leaders incite them to violence. They will know that this crop of people do not give a rat’s behind about their (the people’s) plight. They will fully understand why the government of Kenya can spend millions of dollars in defense of a few men while hundreds of thousands of ordinary citizens (and victims of crimes committed by the very few men) continue to subsist in limbo. They will understand why millions get spent every year to build offices, buy expensive cars and pay for the lavish lives of the ruling elite while ordinary Kenyans starve. They will know that their tribal leaders do not have their interests at heart. Whatever the outcome of the ICC trial, the mystic around Kenya’s ethnic leaders is gone. These little venal and inept men and women who like parading around as gods will no longer have the final word on everything.